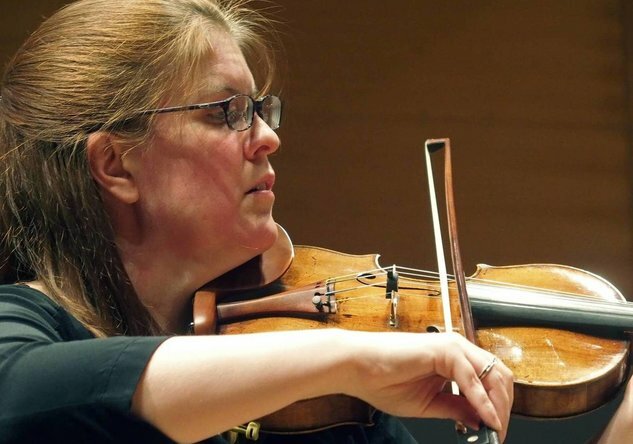 Violinist Erin Keefe began her education and career focused on chamber music, then eventually landed the position of Concertmaster of the Minnesota Orchestra in 2011. She successfully integrates her passion for chamber music into her role as Concertmaster while continuing to perform in the chamber music world. In our interview below, we discuss this blend of worlds, the formation of the AKS Trio, its February 2 PCMS debut program (including the very special Eros piece), and her violin. Jessica Wolford: The AKS Trio includes Lydia Artymiw, piano; Wilhelmina Smith, cello; and yourself. How did this ensemble come together? Erin Keefe: The first time Lydia, Mina, and I played together as a trio was on a series in western Massachusetts in 2010. Lydia and I were scheduled to play the Smetana Trio with the presenter, who is a cellist, and when he fell ill the night before the first concert, we had to scramble to find someone to replace him. I knew Mina from New York since we were both freelancers there at the time, and luckily enough for us, she was available! She rehearsed with us for about an hour right before the concert, and the three of us clicked right away and had a great time during the performances. In getting to know each other better that weekend, we found out that we had more in common than we thought. Mina and I both grew up in western Massachusetts, only two towns away from each other, and it turns out that Lydia spent time there as well in the early 80's when her husband was teaching at Amherst College. Even more surprising is that we all somehow ended up living in the Twin Cities only a few years after our first concert together! JW: Could you share some insights on the February 2nd program? What was the process of selecting these pieces? EK: I wish I could say that there is some underlying theme to our program, but there isn't. The Brahms which ends the program is something that our trio has played several times together, and it is actually the first piece I ever heard Lydia perform (at Marlboro in the early 2000's). She plays it amazingly well, and I knew then that it something I wanted to play with her if I ever had the chance. On the first half, we decided that instead of playing a quartet all together such as Messiaen or Hindemith, we would play pieces with different instrumentation, which gives the audience a chance to hear the clarinet, as well as the other instruments in different roles. To balance the Beethoven and Brahms which are more familiar to the audience, we added the Milhaud, which is great piece but less often played, as well as a new piece by a Finnish composer which was written specifically for Osmo and me. 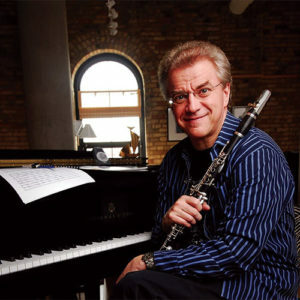 JW: With this PCMS debut, the trio is joined by clarinetist Osmo Vänskä. Osmo also happens to be your husband, and composer Kalevi Aho wrote the Eros piece for your wedding. Philadelphia will be hearing it for the first time. Please tell us about the piece and its significance. EK: Kalevi Aho is a very prominent Finnish composer who also happens to be good friends with Osmo. When he heard that we were getting married, he wrote a piece for us, and Osmo's son brought it with him from Finland to our wedding in Minneapolis. It was a total surprise, and it was the perfect gift since we were actually thinking of commissioning him to write a duo for us anyway! The title "Eros" is a combination of our names (ER for Erin and OS for Osmo), but of course it is also the name of the Greek god of love. JW: In addition to playing with this trio, you are the Concertmaster of the Minnesota Orchestra and an Artist Member of the Chamber Music Society of Lincoln Center. Could you describe the differences and similarities of working with a larger versus smaller ensemble? Is there anything you do differently to prepare? EK: Ideally playing in an orchestra is very similar to playing in a large chamber music ensemble, and I'm quite lucky that my colleagues in Minnesota feel the same way. Different conductors come and go from week to week, but the orchestra and its principal players stay the same. Because of my chamber music background, I focus on the playing of my colleagues at least as much as what is happening on the podium, and I find that this leads to more cohesive performances because the whole group is working as a team along with the conductor. Preparation ahead of the first rehearsal is incredibly important both in orchestra and chamber music since the more you know your own part, the more you can focus on everything going on around you. I suppose the biggest difference is that when you are preparing a piece of chamber music you really need to put a lot of consideration into your own interpretation, whereas in an orchestral setting, you rely more on a conductor to shape a piece the way he understands it. JW: Could you tell us about your violin—its history and tendencies? EK: My violin is a Nicolo Gagliano from 1732. My parents were incredibly generous and helped me buy it eleven years ago, and I actually found it at Moennig's in Philadelphia! I looked at instruments all around the country, and this one stood out from the very first notes I played on it. It hadn't been touched in ten years and only came into the shop two days before, so it was obvious that it would only get better and better, which it has! The body of the instrument is on the small side, which is good since I have small hands, but it has a huge sound and can carry over an orchestra quite easily if I need it to. I'm incredibly lucky to have this violin because I feel like there are no limits to its potential, and it really feels like my true voice. Erin Keefe appears with the AKS Trio and clarinetist Osmo Vänskä on Friday, February 2 at 8 pm at the Perelman Theater. For tickets and information, visit the concert page. For more information on Ms. Keefe, visit her website.